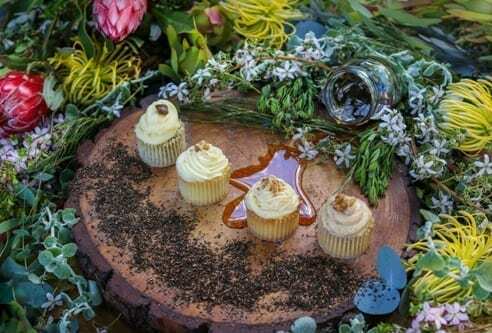 Wine & fynbos cupcake pairing highlights Delheim's eco-passion | Eat. Play. Drink. Cape Town. DELHEIM has always been famous for its tasting room pairing of bespoke cupcakes with its wines. Now, the experience goes next-level with an all-new twist of this evergreen favourite that puts the Cape’s famous Floral Kingdom and the Stellenbosch stalwart’s eco-friendly winemaking front-and-centre. 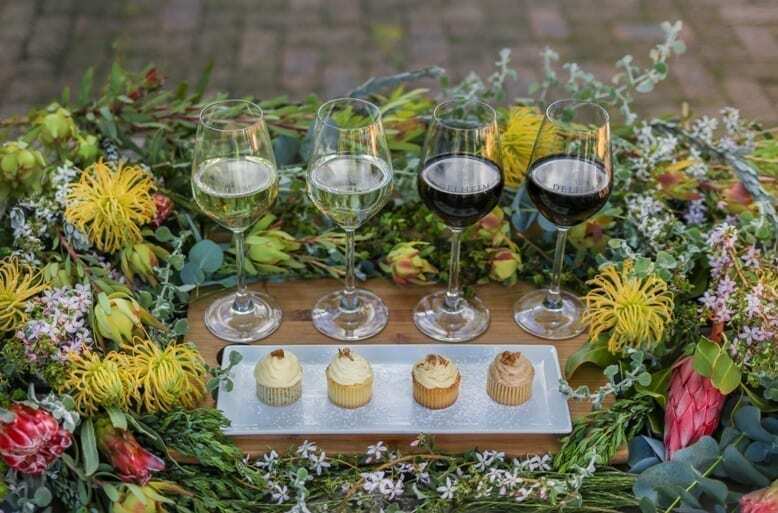 This is Delheim’s Wine & Fynbos Cupcake Pairing – the latest addition that employs an entirely new range of fynbos-inspired cupcakes to showcase the excellence of Delheim wines. The offering makes a fitting addition to Delheim, which is home to the Boland Granite fynbos type and has long been an ambassador for eco-friendly farm practice and sustainable winemaking. There are four cupcakes in the line-up. The fynbos honey cupcake was created using locally-produced Cape coast honey and icing that is cream cheese with honey-based. It is paired with Delheim Merlot and highlights the wine’s red fruit flavours. Notes of blueberries and plums fit sublimely with the sweet honey of the baked treat. The honeybush cupcake incorporates fine grade honeybush tea leaves and a plain cream icing, and is paired with the Delheim Chardonnay Sur Lie. The wine’s flavours of apple, citrus, stone fruit and a touch of oak and minerality blend in unison with those in the cupcake – sweet and fruity notes of floral blooms with vegetative tinge. A buchu cupcake was developed using a highly concentrated tincture by Durban-based herbal laboratory Phyto-Force. The icing is cream cheese and lemon-based, which adds a zing that fits perfectly when served with the Delheim Gewurztraminer. The wine is known for its aromas of orange blossom, Turkish delight and lychee on a backdrop of citrus zest and is a fine partner to the fresh, crisp bite of buchu. The rooibos cupcake features extracted rooibos espresso as an ingredient and is topped with icing of cream cheese and cinnamon. The creation is paired with Delheim Pinotage, which shows clove, Asian spice and dark berry flavours with a nuance of oak. The natural character of the pairing components – the fynbos-inspired cupcakes and wines – is the thin edge of the wedge of environmental thoughtfulness that has been part of Delheim recipe for decades. The farm’s first environmental management plan was written in 1976. As a WWF-SA Conservation Champion, Delheim is acknowledged as an industry leader for its commitment to conservation, responsible production practices, integrated environmental management systems. It is also a founder member of the Greater Simonsberg Conservancy under Cape Nature’s stewardship programme, actively participating in protection and conservation. Among its initiatives, Delheim uses a bio-natural water management plant that recycles all cellar waste water on the farm; takes care to preserve substantial tracts of mountain fynbos and promote a bio-diversity; and, encourages parasitic insects to control pests in the vineyards. The result has led to Delheim being home to 120 different species of indigenous plants and animals.